Through the optimisation of the lubricating groove, the polygon form and the surface finish, Guhring has developed the exceptional PIONEX fluteless tap. By geometrically modifying the lobes of the fluteless tap the contact area between tool and operating area could be optimised. This reduces the temperature as well as the torque and the axial force by up to 30 percent and tool life is dramatically increased. PIONEX fluteless taps are manufactured from a powder metallurgical steel material that demonstrates a high wear resistance. A special surface treatment in combination with the Guhring established TiCN-coating furthermore ensures a longer tool life. With fluteless tapping the surface finish of the tool is of significant importance as it is a cold forming process. Thanks to a new polishing process the surface could be homogenised and made even smoother. Overall the optimisations are reflected in a longer tool life and improved surface finish quality. In addition, the geometry of the lubricating groove was deepened and made wider, so that more lubricating medium can be transported to the forming lead of the fluteless tap. A further important point is the innovative polygon form. It is with regard to the effective radius which is pivotal for the torque as here the contact area between tool and workpiece is created. Guhring’s PIONEX is available for all important thread types: Metric, metric-fine, UNC, UNF and pipe threads. 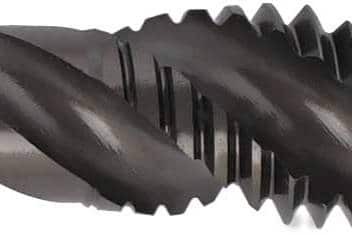 In addition, PIONEX covers the diameter tolerances 6HX and 6GX as well as form C and form E. As an option with internal cooling the tool is available with axial as well as radial cooling. This covers a complete package of the most important thread types. Thanks to shank tolerance h6 the new fluteless tap generation can be applied in all current clamping chucks. Dank einer homogenen Schneidkante kann eine hervorragende Schichthaftung realisiert werden. Konisch abgesetztes Gewindeteil für optimale Spanabfuhr. 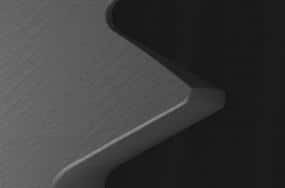 A special surface finish treatment in combination with the TiCN-coating ensures increased wear-resistance. Tapered thread for perfect chip evacuation.